So far, we have travelled over the Malahat and along Highway 1 and the original Port Mann Bridge in our time machine travels. Today we are very excited to share the next installment of our series with you – Highway 97 from the U.S. border to Vernon. It’s a long ride, so we have broken it up into three segments for you to view; the U.S. border to Penticton, Penticton to Kelowna and Kelowna to Vernon. Looking back on these old reels reveals a lot more than just pavement condition. 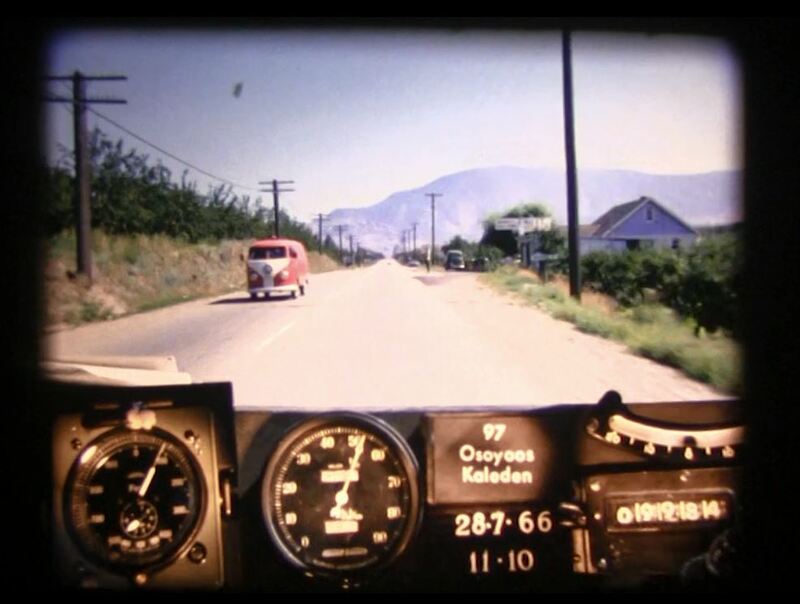 The camera installed onto the dash of a car and driven over 9,000 km of BC highways captured some incredible glimpses of our province during the heyday that was the 60’s. So sit back, relax and watch a world long gone by in the rear view mirror. So, where were you in the summer of ’66? Did you see someone or something you recognize in these films? Let us know in the comments below. You can also connect with us on Twitter, Facebook or check out our collection of snapshots of life as it looked to those living and travelling along BC highways during the year 1966 on Flickr. 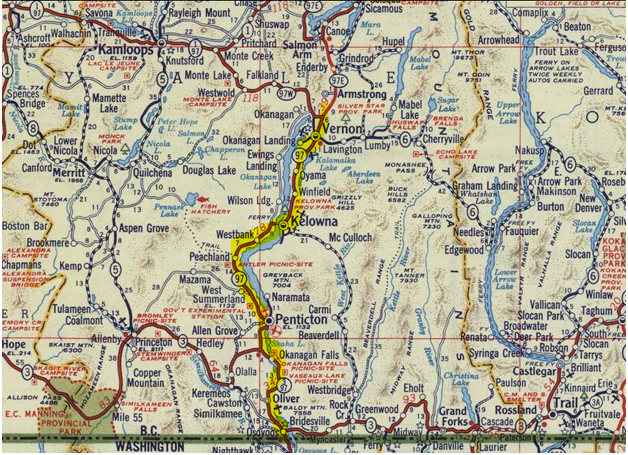 1966 BC Highway 97 photolog route shown highlighted in yellow on a Shell British Columbia/Alberta Map. Produced in 1956. I was born and raised in Vernon in 1943, and traveled this highway a lot as a kid. It was like a drive through memory lane. I am eagerly awaiting, both the drive to Kamloops and the drive up to Sicamoos. I don’t know if it has been posted, but I would love to have the Fraser Canyon and the Hope Princeton. Do you intend to post these as well? As you stated, it is the closest thing to a time machine. I slowed the video down to .25, and thoroughly enjoyed it! Hi Bob – we have captured the Hope-Princeton, the Fraser Canyon and the Okanagan in 1966. Here’s a link to the videos in our BC Road Trip Time Machine playlist on YouTube. Hi, could I please use this footage as the projection for a driving sequence on a video contest I’m entering? Absolutely amazing footage. Please note, there will be a cash prize for the winner. Thanks for your interest in our footage – we think it’s pretty amazing too. 🙂 While we post this footage for everyone to enjoy, it cannot be used for any sort of commercial gain (cash prizes etc.). Thanks again for connecting with us here and asking. Great fun, and also a wonderful resource for a book on the history of BC’s roadside fruit stands that I’m co-authoring! Set the play-speed at 0.25 and you can see quite a bit of interesting detail. Will look forward to seeing more! is it possible to watch these more slowly somehow? I love them ! amazing to see ! Glad to hear you like the videos! We have slowed them down to 25 percent of the their original speed – but you can also control the speed on YouTube. Click on the settings icon (the gear in the bottom right of screen) and choose the speed you would like. Hope that this helps! Do you have one of the Hope-Princeton or Hwy 3? I’m sure we do but we’re having to slowly go through quite a pile of these, that aren’t very well labeled, so it make take us some time to confirm. We’ll definitely share once we do. I’ve lived in Vernon since the mid-seventies but attended VACC as a cadet in ’66 and ’67 and then on staff in ’69. That amazing old footage brought back a lot of memories of Vernon as a quiet, almost rural little town and how completely unrecognizable just about everything about it is today. Thank you so much for posting these old films, they really are almost like a real time machine. On another note, do you know if other provinces undertook similar projects? I’d love to see vintage films like this of Alberta roads since I grew up there. Again, thank you for posting and I look forward to seeing more! Thanks again for connecting with us and stay tuned for more videos! Born in Kelowna in 53. Lived in Okanagan centre for 18 years. Recognized that whole section of Kelowna to Vernon. Seen gas station I worked in Winfield [ gas was 25 cents a gallon then]. Rode on or drove the road from US border to Vernon many times. section at Osoyoos was all orchards then. sure nice to see old cars and the video footage of the road. What a great idea! I remember doing the trip many times as mom got all her fruit in the Okanagan for canning. But… a complaint. Please….Could you slow it down? I felt I had to wear a seatbelt on my chair and my foot kept looking for the brakes! It actually gave me a headache, it was going so fast. Glad to hear you liked it! Believe it or not this film is slowed down to 30% of its original speed. We will try to slow it down just a smidge for the next rendition. Thanks for connecting with us here, let us know if you have any other questions and we would be glad to help! This is quite neat. I got my licence in 1966 while living in Kamloops but drove to Vernon and Kelowna a few times so it brought back a few memories. Is there a way to put it on slow motion? Thanks for connecting with us here. This film is actually slowed down to 30 percent of its original speed. If you view it on YouTube, you might have better luck pausing on screens to see the details. Hope that this helps. as U post these gems of our past don’t forget the Kootenays west/east. grew up there and would like to see the change. watched the u.s. border to Penticton and was amazed how little the road has changed from Osoyoos to Oliver. Thanks for connecting with us here! We certainly won’t forget the Kootenay area in our revival of these films. We are focusing on the Northern area of the province next, then we will focus on other areas. This is a fascinating look back in time! I am a transplanted Vancouverite now living in Fort St John and would love to see some of the footage from the North East. Where can we access that? I am sure there are many up here who would love to see footage outside of the south western part of the province. Thanks! The North is next on our list! Stay tuned! Glad to hear you liked it. You can slow the speed of the video down on YouTube by clicking on the settings (the gear icon) in the lower right portion of the screen. Hope that this helps! This is fun …. will you be posting more of these, I live in Campbell River and it would be great to see the video of the area. We will be posting more of these Dave, our next focus will be the Northern part of the province. Stay tuned!